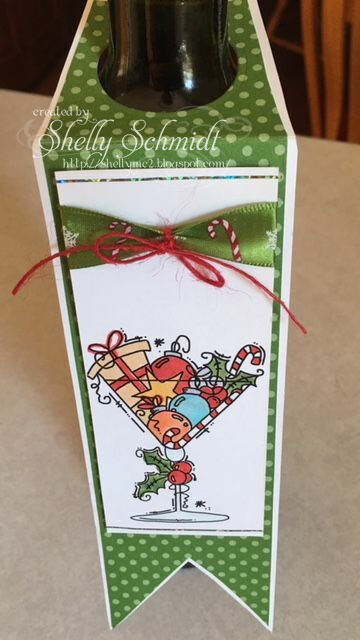 Your fabulous tag is a great way to present the gift of a holiday bottle of wine! Love it, Shelly!! I love this. Always wanted to try one and just haven't gotten around to it. Cute design. Great minds really think alike, Shelly. I haven't made many wine tags before but I may start doing that rather than buying the bags at the Dollar Store. They can be more personalized. So gad to see you joining along at CTB this week. I know Bugaboo stamps are hard to resist. The reason you can do more than one card at a time in a post (at least for this one) is that I am adding the same link but to two different posts at CTB. What I can't do is add both cards at the same link. So I wouldn't be able to add both cards to say The Outlawz challenges. I couldn't add them to InLinks twice but I could add them to two different challenges. I hope that makes sense. Have a great Thursday! Awesome bottle tag. Love the image you used and glad to see you're playing in our CIJ at Catch the bug. Shelly that tag is gorgeous and is perfect for the wonderful gift of wine.